Squad: Ricky(GK), Bryn, Matija, Charlie, LT, Sean, Danny H, Alex (Captain), Darius, Enzo, Kafi, Josh, Matt H, Marco and JB. This was DBFC’s 19th of 22 league games this season and they needed only one point to secure the League Division 1 champions trophy. It was windy but at least cool and cloudy, so decent conditions for footy. DBFC started well with some nice passing footy and went very close on a couple of occasions. Darius was playing fantastic stuff down the right wing, skinning the Bants’ left back at will and firing in some great crosses that deserved a goal. Kafi came very close to scoring with a header that came off the near post. After 15 minutes DBFC got the goal that they had threatened to score when Darius, yet again, glided past the Bants’ left back, then centre back, to get to the by-line, look up to spot Danny H coming through and pulled the ball back to the edge of the 18 yard box for Danny to place his side-foot shot into the corner of the Bants’ net. At this point DBFC managers were expecting a bag full of goals however, DBFC seemed to take their foot off the pedal and the football became scrappy with untidy passing and poor first touches. Although Bants did not seriously threaten to score, their long ball tactics meant that the DBFC defence needed to be switched on throughout the game. 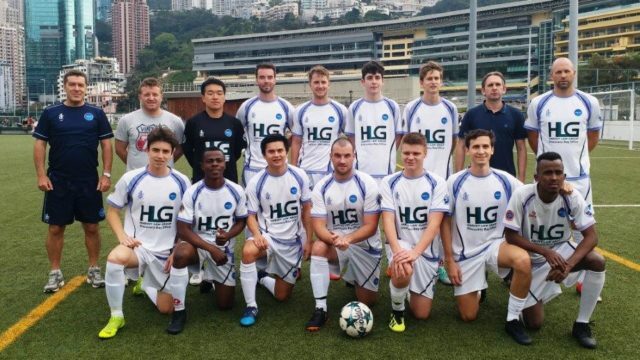 DBFC were practically camped in the Bants’ half and a bit of frustration was creeping in to the DBFC football after seeing great opportunities to score being missed time and again. Darius got so many crosses in that should have been converted. Morse was trying to shout with a sore throat on how he could have managed to score and Gazza was reiterating the point that when he was a lad he’d have had a hat-trick, while Scotty shrugged his shoulders and cracked open another can of beer. Kafi hit the far post with a header from another delightful cross from Darius that really he should have put in. Sean was teed up for a couple of shots from the 18 yard box that just caught defenders throwing themselves in the way to take the sting and accuracy from the shots. There were at least two goal mouth scrambles that defied logic on how they didn’t go in. Half time came and Morse asked the team to keep up the pressure but to slow down a bit with the urgency to press forward so that the passing accuracy could improve. JB and Matt H came on and goals were expected. As in the first half DBFC were camped in the Bants’ half and working the ball from side to side of the pitch to get around the back of the Bants’ defence. The passing and movement was well improved yet DBFC couldn’t put the finish to the dozens of great chances offered, mainly from crosses in from the wings. Credit to Bants who were sitting deep and defending with great commitment and the Bants’ keeper doing well on a number of occasions to block and save. It was all happening at the Bants end of the pitch but the occasional long ball towards the DBFC goal was dealt with by Matija and his defence. There was one scare when a long ball forward by Bants, towards Ricky’s area, resulted in his shout to his CBs to leave the ball but it held up in the wind and didn’t quite make the DBFC goal area. So as Matija and Bryn looked on in horror Ricky bellied the ball forward and cleared 10 yards to the lone Bants forward who’s attempted shot was blocked but deflected into the path of another Bants player who’s long range shot was saved by a recovering Ricky. Morse was having a side-line fit at this point and his voice had all but disappeared, while Scott just shrugged his shoulders and cracked open another can of beer. The pick of the DBFC attempts were JB hitting the bar full on from a volley at the edge of the six yard box, after a lovely cross from Matt H and Matija putting a free header over the bar at the far post following a great corner from Enzo. Josh Brown had a great attempt with a superb volley from Enzo’s lofted pass to the Bants’ far post but unfortunately the powerful shot was straight at the Bants keeper. No matter the frustrations of not scoring more goals, the win and the points to lift the League Division 1 title were secured. Although the League trophy was not presented at this game, DBFC cracked open a few bottles of Champagne at the HV pitch and managed celebratory tequila shots and beers at the Pier Bar. League champions for the third time ——– COME ON DBFC!!!!!! MOM: a few to mention but it was clearly Darius who was causing havoc down the right wing and setting up chance after chance for his team mates to score, which they failed to do, except Danny H’s lone goal. DOD. This must be Kafi for admitting he has lost his DBFC kit that Gazza bought him. If anyone sees a no. 10 DBFC shirt with KAFINIHO on the back, please report it to the authorities because the wearer must be clearly mad / bonkers!